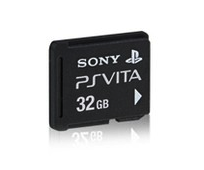 Sony revealed quite early on that Europe will not be getting a taste of 32GB memory card, no apparent reason was given, however now Sony's Feral Gara reveals there plans for releasing the 32GB memory card in Europe. You've made all games available to download, but memory cards will fill up very quickly, forcing gamers to consider forking out for a new one. Fergal Gara: It's a very good point, and we've already learnt from the early days in Japan that we probably haven't got big enough memory cards introduced for the UK market. We've already gone to secure bigger size cards to bring them into the UK market. It's early days. Before it comes to market you just have to guess what people are going to want. We thought they'd want a lot of 4GB cards just as the minimum, and then they buy packaged media. But actually, the way it's going is, many of the early adopters are clearly going to download a bit more, or just want to buy the big chip in case. It's going to evolve. But we can certainly see they want bigger cards. Though no official release date was given, 32GB memory cards will probably hit European shelves within 2 months, or you could just import a Japanese card if your desperate for an extra chunk of memory, just click the blue banners above the article. Let us know what you think of no 32GB memory cards in the comments below!